One extremely frustrating problem that arises with IPv6 under Linux is the race condition caused at system boot by IPv6's Duplicate Address Detection (DAD). DAD is a new feature in IPv6 that protects against IP address conflicts. The way it works is that after an address is added to an interface, the operating system uses the Neighbor Discovery Protocol to check if any other host on the network has the same address. If it finds a neighbor with the same address, the address is removed from the interface. The problem is that until DAD can confirm that there is no other host with the same address, the address is considered to be "tentative." While it is in this state, attempts to bind() to the address fail with EADDRNOTAVAIL, as if the address doesn't exist. That means that if you have a service configured to listen on a particular IPv6 address, and that IPv6 address is still tentative when the service starts, it will fail to bind to that address. Very few programs will try to bind again later. Most either continue without listening on the failed address, or fail to start altogether. Apache, for example, fails to start if it can't bind to an address. DAD is fast, but not always fast enough. Since services like Apache are started soon after networking is configured on system boot, there is a race condition. Sometimes your critical services start on boot, and sometimes they don't! This is clearly not acceptable behavior for a production server. For this reason, I always disable DAD on servers that use IPv6. When DAD is disabled, addresses are immediately usable, just like they are with IPv4. Without DAD, I have to trust myself not to shoot myself in the foot with an address conflict, but that's nothing new. Besides, most of these servers are in data centers that restrict the IP addresses on the switch port anyways. As IPv6 becomes more widespread, I expect this to be addressed in earnest, but until then, disabling DAD is the way to go. Update (2013-05-05): A bug report has been filed in Debian about this issue. It proposes that ifupdown's init script not return until DAD completes on all interfaces. 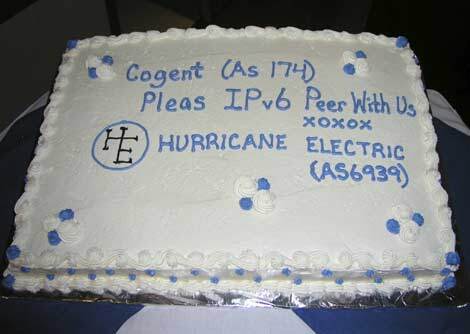 I was recently affected by the long-standing IPv6 peering dispute between Hurricane Electric and Cogent. On one of my systems which uses Hurricane Electric's IPv6 tunnel broker, connections to dual-homed hosts on Cogent's network were taking unreasonable amounts of time to establish, as attempts to use IPv6 had to time out before IPv4 was tried. Reverse DNS lookups on Cogent IP address space were taking 10 seconds to time out, causing frustrating delays for incoming ssh users, even over IPv4. Before you go blaming the tunnel, you should know that I observed the same problems from a server in a Hurricane Electric data center with native IPv6. I've long been a fan of using reject routes to force faster failover when faced with less-than-ideal network conditions, so I turned to them again to work around this issue. I knew that if I added reject routes to Cogent's IPv6 address space, applications would immediately fail over to IPv4 without needing to first time out on IPv6. First, I used Hurricane Electric's handy BGP Tookit to look up the IPv6 prefixes announced by AS174. AS174 is Cogent's autonomous system number. Conveniently, it was printed on Hurricane Electric's cake, saving me the trouble of looking it up. I stuck this in a system start up script so it's run every time the system boots. This solves the problem, in the sense that there is no longer a long delay when accessing dual-homed Cogent hosts. Of course, it precludes the use of IPv6, which would be a problem if I needed to contact an IPv6-only Cogent host. Fortunately, hosts will be either dual-homed or IPv4-only for the foreseeable future. Still, I'm appalled that even after the World IPv6 Launch, two major transit providers are locked in such a lengthy IPv6 peering dispute. If someone asked you whether it was safer to write a setuid program or a setgid program, what would you say? What about a setgid-only program versus a program that was both setuid and setgid? Instinctively, I would say setgid-only: setgid grants fewer privileges, which by principle of least privilege ought to be a good thing. Not so. Here is a story that convinced me that setgid-only programs are inherently less safe than setuid programs. The TAs at Brown's Computer Science department keep track of student grades using a homegrown system written in Python with some shell thrown in. One common command is report STUDENTLOGIN, which lists the grades for a particular student. The grades are stored in a file readable and writable only by the course's TA group, of which the TA staff are members. Someone decided that it would be nice for students to be able to check their own grades at any time. So a setgid wrapper program called "mygrades" was written in C. It was owned by the course TA group and exec'd the report command with the username of the real user ID (i.e. the student who invoked the program) as the first argument. The wrapper program was written very carefully and scrutinized closely. In particular, the environment was completely wiped and replaced by a safe environment. What could possibly go wrong? #!/bin/ksh # Assume that this script is installed one directory down from the course directory root (e.g. in tabin) export COURSEDIR=$(readlink -f "$(dirname "$(whence "$0")")/..") export EVALPIG_ROOT=$(readlink -f "$(dirname "$(readlink -f "$(whence "$0")")")") export PYTHONPATH=$COURSEDIR/config:$EVALPIG_ROOT exec python -O -c "__import__('$(basename "$0")').main()" "$@"
Can you spot the vulnerability? Keep in mind, the environment is completely safe. So are the arguments (including $0). The problem is that KornShell implements command substitution (i.e. $(...)) by creating a temporary file (in /tmp), redirecting the output of the command to the temp file, and then reading it into the variable. Since mygrades is a setgid wrapper, the user ID does not change. Consequentially, the temporary files are owned by the user who invoked mygrades. The user can write to one of the temporary files and as a result, inject arbitrary data into one of the script's variables. This is bad for any script, and really bad for the script above. An attacker could effectively set an arbitrary PYTHONPATH and thus execute arbitrary Python code with the permissions of the TA group. Of course, the temporary file exists only for an instant (it's unlinked immediately after being opened), but I easily wrote a program that monitored /tmp with inotify and opened the file as soon as it was created. It didn't work every time, but if I ran mygrades in an infinite loop my attack would succeed within a minute. What is counter-intuitive is that if the mygrades program had been setuid, this wouldn't have been a problem. The temp files would have been owned by the effective UID of mygrades and would have been tamperproof. Linux (and any decent Unix implementation) otherwise does a very good job protecting setgid programs from tampering by the process owner: the owner of a setgid process isn't allowed to ptrace it, debug it, etc. But the kernel can do nothing to protect the files that a setgid program creates on the filesystem. For this reason, unless you are sure that a program will not create temporary files at any point during its execution, or you are sure that a tampered-with temp file will not lead to a security compromise (which is probably a bad assumption), it is safer to make a program setuid than setgid-only. Update: See my followup article, Easily Running FUSE in an Isolated Mount Namespace, for a solution to this problem. FUSE is cool, but by its nature has to introduce some non-standard semantics that you wouldn't see with a "real" filesystem. Sometimes these non-standard semantics can cause problems, as demonstrated by a recent experience I had with rsync-based backups on a multi-user Linux server that I administer. The problem is that, by default, only the user who owns the FUSE mount is allowed to access it. Not even root can. This is a security measure, since a malicious user could wreck havoc with a malicious FUSE mount (imagine an infinite filesystem, for example). This behavior can be changed (with the 'allow_root' mount option, which has to be explicitly enabled by the super user in fuse.conf), but that's not the answer. Besides the security implications, that would cause rsync to descend into the sshfs mount and start backing up the remote system! The problem is that rsync needs to be able to access everything it's backing up. Running as root, this is usually not a problem. Root not being able to access something on the filesystem seems weird, but is actually nothing new - root-squashed NFS mounts can also cause this. But FUSE mounts are worse. To begin with, unlike root-squashed NFS mounts, users are allowed to plop down FUSE mounts anywhere they like. But worse, root isn't even allowed to stat FUSE mounts. This means that rsync's -x option (to not cross filesystem boundaries) can't even be used to exclude FUSE mounts, since rsync needs to stat the directory to determine if it's a mount point! This behavior is outside of POSIX, which says that stat shall return EACCES if "search permission is denied for a component of the path prefix." In my opinion, a worthwhile addition to fuse.conf would be an option to restrict FUSE mounts to specific directories. With such an option, the admin could restrict FUSE mounts to locations that aren't backed up. Until then, FUSE is disabled on this particular server. and interrupting ssh with Ctrl+C. On otherhost, sleep will still be running. Its parent, the sshd process forked to handle the connection, will be gone, and sleep will have been reparented to init (PID 1). You don't get this problem when you use ssh interactively. All the processes that you start have a controlling terminal, and when the connection dies and the controlling terminal goes away, the processes you started are killed with SIGHUP (unless they detached from the controlling terminal, such as with setsid). But this isn't always feasible, especially if you're running ssh from a script which doesn't have a terminal. Naturally, this is a Linux-only solution. On other systems, the best solution (as far as I can tell) would be to fork and exec the command. In the parent, continuously poll the parent PID (with getppid()). When it changes to 1, you know the parent has died so you kill the command.